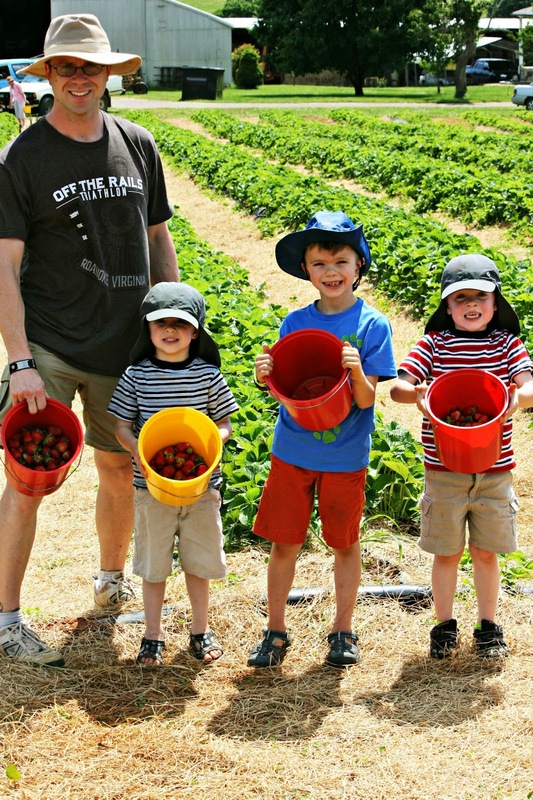 A few weeks ago we went to pick strawberries. They were late this year, because of the extended winter. Reid was a champion berry picker. Cort was close behind, very intent on finding the perfect berries. Then there was Pierce. Who picked seven berries. That's right, seven in his bucket. But see the slight bulge in his belly? In the end, we got enough to make jam. And this year? My strawberry jam set perfectly! It must be a very nice day on strawberry garden. We haven't had strawberry on our garden. My favorite jam... is pineapple jam, emmmm so yummy! We are devout blackberry jam eaters in our family. That is cute about Pierce eating more than he put in his pail! I love strawberry and blackberry jam! Really nice photos! I suspect that some of the berries didn't make it in the buckets. Lots of fun picking strawberries and no thorns! Blueberry or grape...jellies...I'm not much for jam..too much texture going on there for breakfast! HA! Your boys look like they had a fun day. I need one of those hats for when I mow to keep the sun off my neck. I have feeling he ate more than seven berries! geweldig met zoveel hulp dat moet wel goed komen. such cute boys! love blackberry! We had our first strawberries this weekend as well. Yay! I love this time of year. Seven berries? That is so funny! I have the same problem as Pierce when I pick berries. I love strawberry and blackberry jam. These are really wonderful pictures! 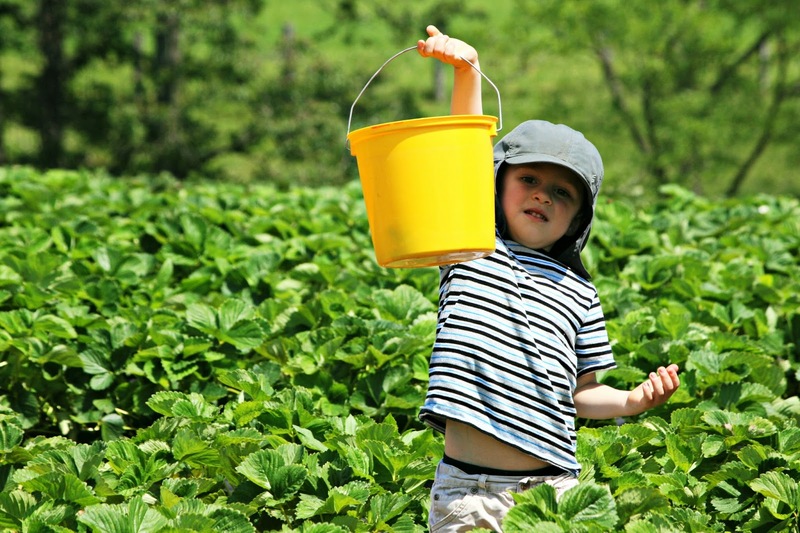 Strawberry picking with the kids, it doesn't get much better than that!! And eating them along the way is all part of the fun. What a fun day! 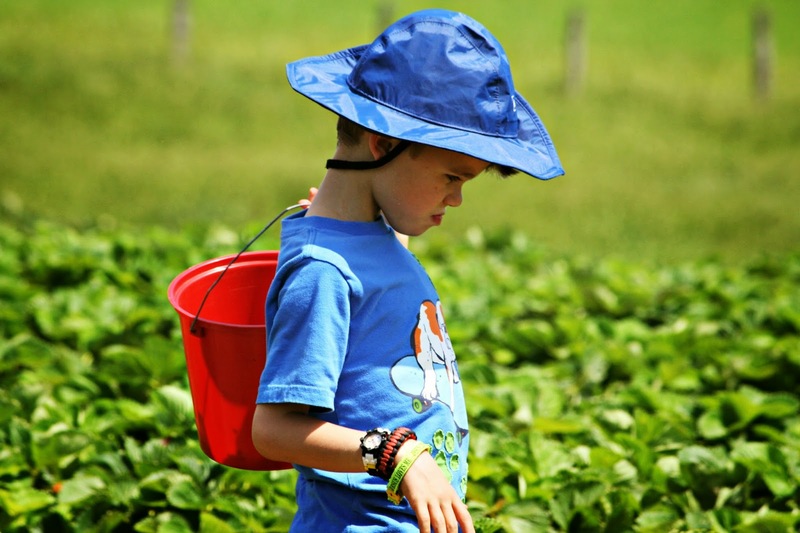 Your kids get to do all kinds of organic activities. I like cherry jam! Mainly because they others make my mouth feel like it's burning. That would be a fun family outing. We used to go to a blue berry farm and pick blue berries. Glad your jam set up. We had a spotty record that way when we used to make jam at the house. 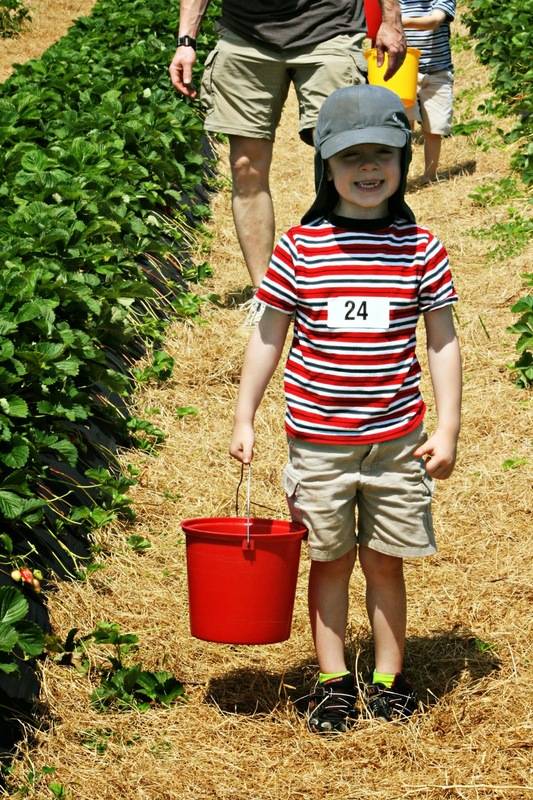 I always enjoyed berry picking with the kidling! My favourite jam probably has to be one made by the Amish here; it's called.... really..... 'Traffic' Jam. It's filled with all kinds of fruits and is absolutely delicious. What a great family outing! And Pierce gets my vote. I mean, why wait for the jam? I'm really impressed I don't see more red stains on little faces, lol. Favorite jam is a blueberry damson conserve I made up; it's absolutely divine! Good woman! My late mother would always make jam. She parsed out one jar at a time. I miss her, and her jam! I thought of this the other day. I have not made any!!! I don't like jam, but I love picking blueberries. They just fall off the bush--making the job EASY! I like a grape jam. Well done pickers! Our strawberry crop in the area was poor due to the weather so we did not pick this year. First time in a long time. My favorite is strawberry, but the kids would go grape. What a fun and tasty event for your family. I DO love strawberry jam too!